Exploring new ground on the pitch 6 variation of The Tower Arete. The west face of Snowpatch is the most heavily developed wall in the Bugs. The numerous corner systems, sunny exposure, relatively modest height, straight forward descents, and abundant moderate lines all contribute to the walls popularity. The face can be divided into two halves the north summit and the south summit, the Beckey Greenwood tracing a definitive border between the two. Eighty percent of the climbs are under the south summit; this sector has numerous weaknesses and is relatively low in angle. The North Summit on the other hand is much steeper and although it also has many crack systems, they are much more singular and defined than the broken, exfoliating systems under the south summit. 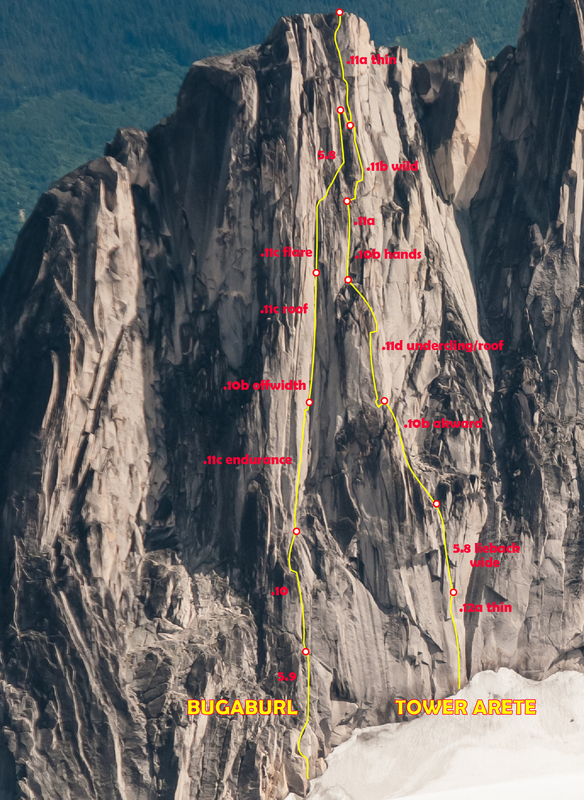 The steep white column of the N Summit, West Face is probably the most underrated formation in the park for hard free climbing, and although shorter, is comparable to the Minaret or the Egan Wall. The Direct North Summit route, established in the early 80’s is probably the first really sustained free climb established in the park, repeat ascents report it to be fairly underrated at the original 5.11+ grade. 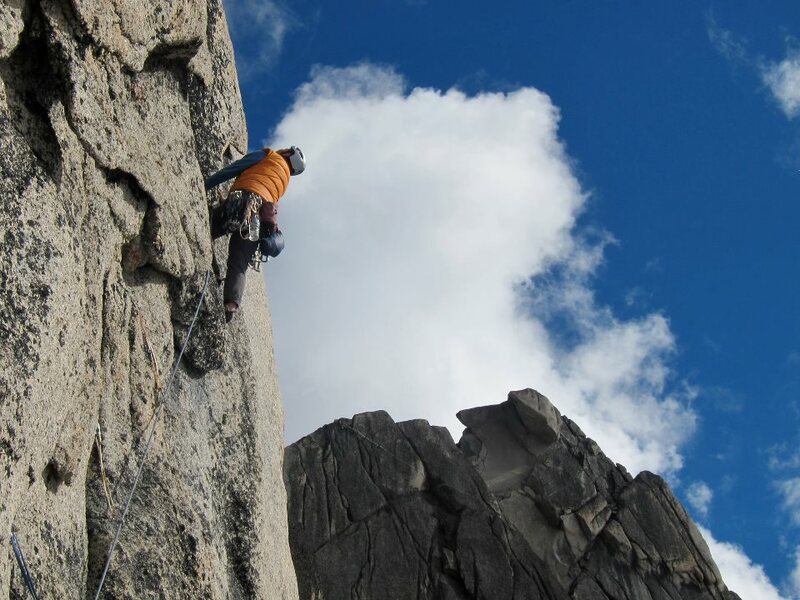 Two other routes exist on the main face: The Tower Arete and Bugaburl, both are excellent. Starting up the Tower Arete. This wall is shady in the morning, but basks in the sun for most of the day. The westerly aspect faces the dominant weather flow, unlike the east faces in the area you can usually see the bad weather approaching. Neither of these routes has fixed belay anchors, and retreating will require leaving gear behind, two ropes would also be an asset in the event of retreat. The straightforward fixed rap line down the Beckey- Greenwood brings you back very close to the start of the route, where you can leave packs, boots, etc. Pitch 3 endurance corner is in the center. This line is so obvious it is amazing that it wasn’t established until 2007. 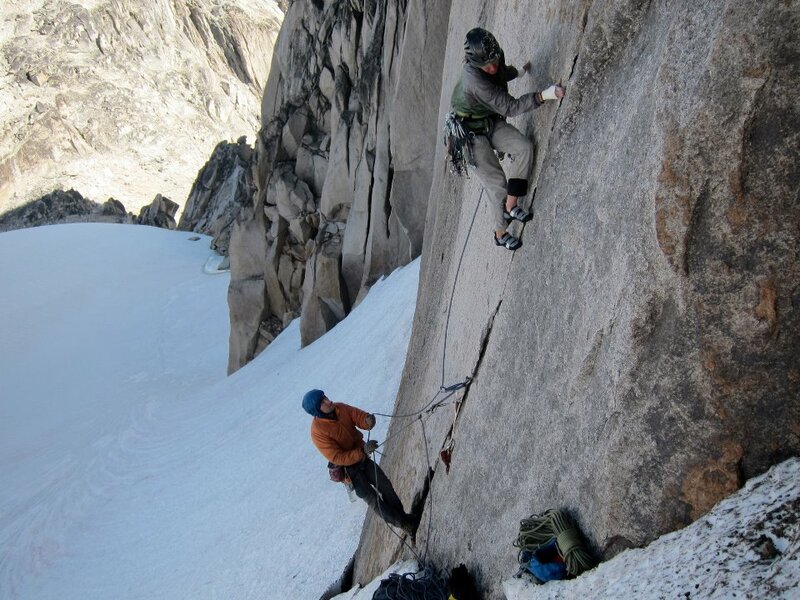 The heart of the route is three 60m rope stretching pitches of meat and potatoes crack climbing. The start of the climb is obviously marked by a crescent shaped chimney, climb past this up broken ground. 5.9. A corner system is overcome by a couple of tricky cruxes, finishing at the base of an unappealing, mossy chimney. 5.10. The endurance pitch. Climb up and left into steep and leaning right facing corner. Sustained laybacking, followed by insecure corner chimneying. Set up a hanging belay at the base of an offwidth. 5.11c. The short offwidth puts a good fight. Sustained, flared hand jamming finishes with committing lip move around a small roof to a decent belay stance. 5.11c. More steep, burly, hand jamming. Relief from the arm pump can be achieved with calf pumping chimney-less chimney moves. 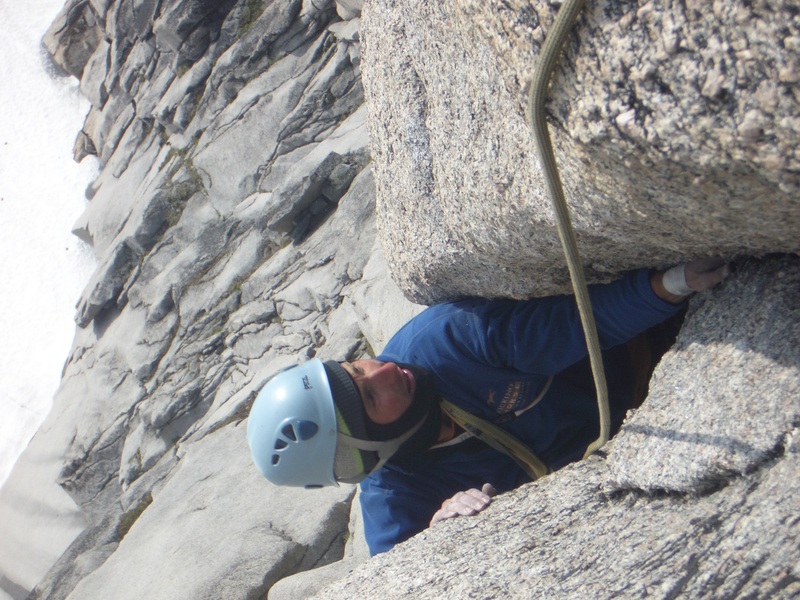 After approximately 30m start trending right on much easier terrain belaying from the summit of a small pinnacle. 5.11d. Down climb to the right, climb up an easy corner to a short thin crack crux which leads to elegant cracks culminating with another crux which deposits you on the summit ridge. 5.11a. A burly rack for a burly route. Looking down the barrel of pitch 5 of Bugaburl. Double set of cams to # 3 BD, triple up on hands down to “big finger” size cams. Nuts, extra runners and one # 4 BD. Note: The three crux pitches are nearly 60m in length, belays are not fixed, rack accordingly. Down climb and one short rappel to the east, follow the ridge south to the top of the Beckey-Greenwood. Fixed straightforward, rappels, 6 x 30m or 3 x 60m leads back to the Vowel Glacier. Originally climbed at 5.10 A2. The current free climb utilizes different belay points and has one highly recommended variation pitch. 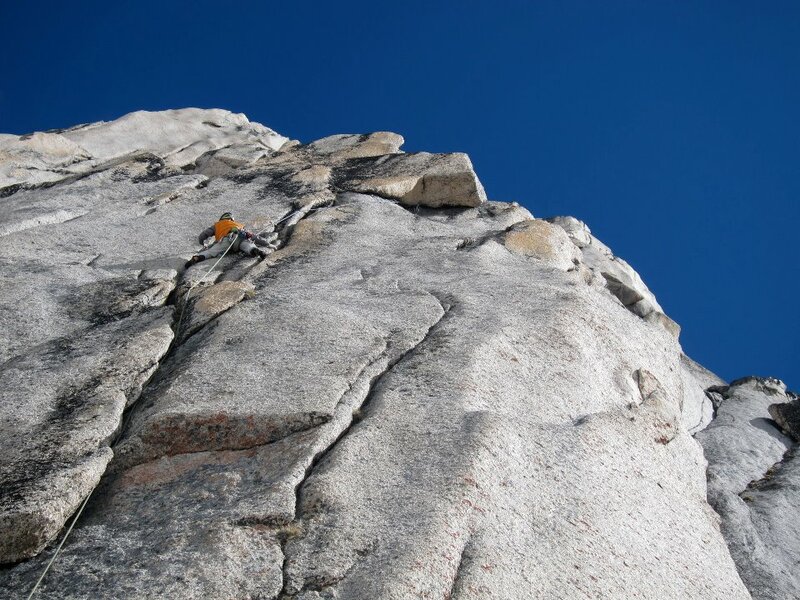 Steep pitches are punctuated by spacious belay ledges atop a series of towers. The start of the route is marked by an appealing thin flake crack. Climb the thin flake, some committing face moves lead into a shallow corner, desperate moves and tricky gear lead to a small belay stance. 5.12a. Layback wide flake past overhang, ignore old hanging belay and continue up easy ground to alcove belay. 5.8. Climb deceptively difficult wide corner passing an awkward wide bulge to nice ledge atop the first tower. 5.10a. Pitch 4 of the Tower Arete. Climb down left to access finger cracks on beautiful golden head wall. Sublime crack climbing leads to an aggressive undercling roof crack. 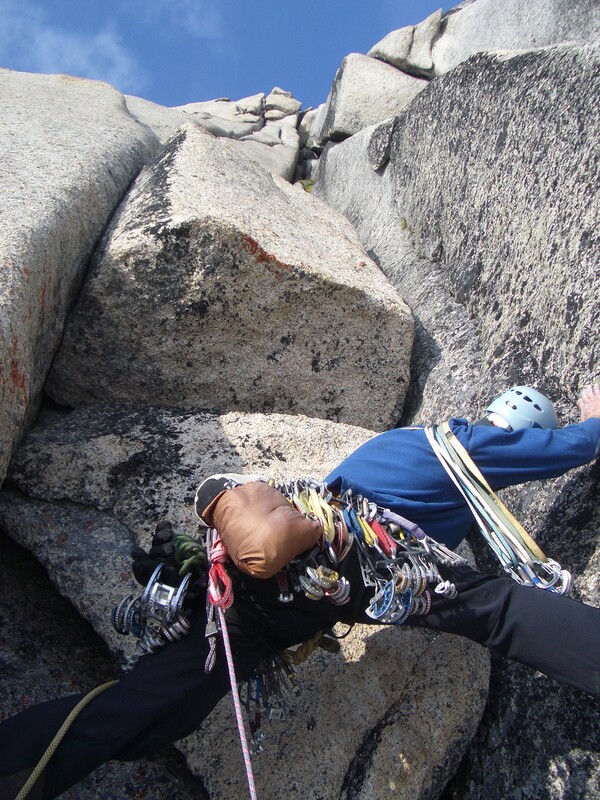 Continue up to a large belay ledge. 5.11d. Climb through jutting flake to access thin hands crack in an obvious right facing dihedral. 5.11a. Move right on hollow flakes until it is possible to undercling out right over the abyss, continue battling up difficult shallow flare, which is easier to protect by climbing straight in but easier to climb by laybacking the edge. 5.11b. Note: this pitch can be dodged by climbing straight up through mediocre 5.8 terrain. 1 x # 4, # 3, 2-3 x # 2 – tiny cams. Nuts, RP’s, emphasis on small hands size and down. Note: belays are not fixed, rack accordingly. Pulling the crux roof on pitch 5 of Bugaburl.